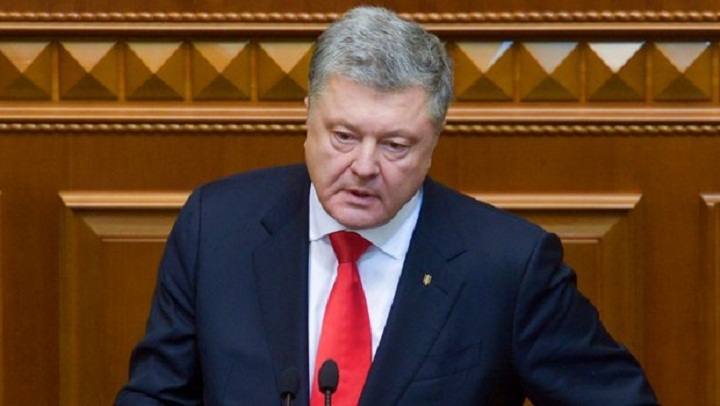 Ukraine's president says that the country has barred Russian men between 16 and 60 from traveling to the country. The move comes as the long-simmering conflict between the two nations escalated in the Black Sea on Sunday. Russian border guards opened fire on and captured three Ukrainian vessels and their 24-member crew. President Petro Poroshenko tweeted Friday that the restrictions on Russian travelers have been taken in order to prevent the Russians from forming "private armies" fighting on Ukrainian soil. A Russian government-appointed ombudswoman says the three commanders of the Ukrainian vessels captured near the Russia-annexed Crimean Peninsula last weekend are being transferred to Moscow. The long-simmering conflict between Russia and Ukraine bubbled over Sunday when Russian border guards opened fired on three Ukrainian vessels in the Black Sea. The Russians then captured the 24-member crew. The Tass news agency on Friday quoted Russian government-appointed ombudswoman Lyudmila Lubina as saying that the vessels' commanders are being transferred to Moscow for interrogation. The other 21 remain in custody in Crimea.